Has an “oops” moment with a can of gasoline left you—and your garage floor, car interior, or clothes—fuming? Banish the odor with one or more of these fast-acting fixes! Whether you’re planning a road trip or gearing up for an outdoor DIY project, the task ahead starts with checking and often replenishing your fuel tank. 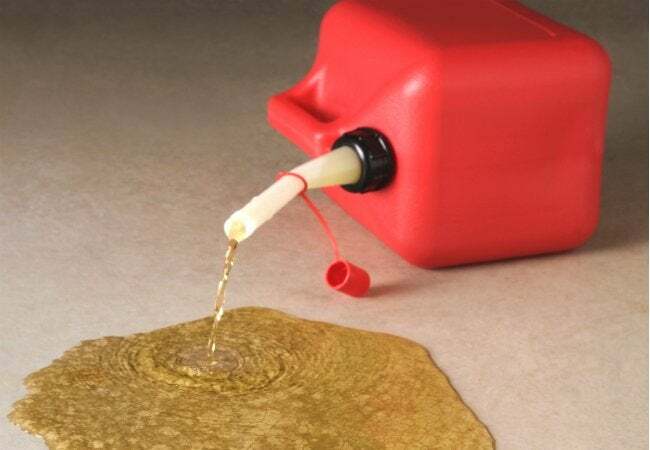 But be careful: Even the smallest drip of gasoline while filling up at the pump, transporting a gas can, or refueling motorized lawn equipment is enough to cover your cement floor, car interior, or clothing in its unmistakable odor. Should you, your car, or other surface be so unlucky as to get splashed, you’ll want to both cautious and efficient about the removal of this highly flammable and smelly substance. Rather than temporarily mitigating the scent by airing the stain out or spraying on fabric deodorizer, take action with one of these odor-fighting ways to get rid of gasoline and its smell. If your heavy-duty landscaping equipment’s fuel tank leaks gasoline onto the cement floor of your garage, that puddle can quickly become a permanent stench. Fortunately, you can lift the liquid and the smell with a supply of cat litter. 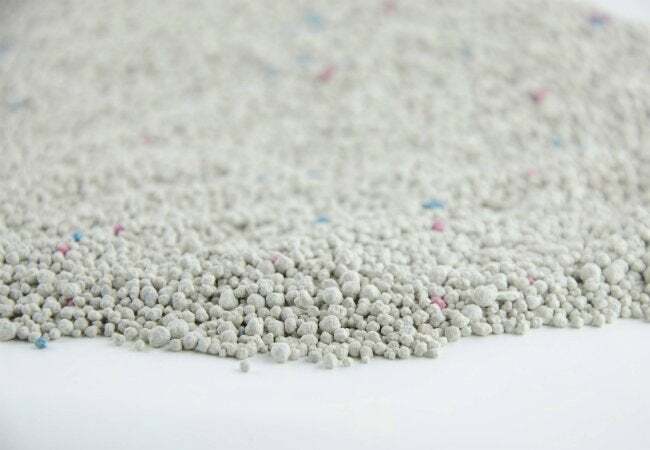 Just as the clay granules excel at cleaning up after your feline friend, they too can also quickly absorb liquid and combat odor from gasoline spills. For optimal results, act fast! Don’t wait until the gasoline evaporates to try this approach. Generously spread odor-absorbing cat litter over the still wet pool of gasoline. Leave it to soak up the spill over the next one to two hours. Use a broom to sweep the gasoline-soaked remains into a dustpan, transferring them to a sealed bag or old plastic takeout container to completely seal in the smell. Check with your local laws to correctly dispose of the contaminated cat litter. Open the garage door while you work to air out any lingering odor. When a gas nozzle precariously peeks past an open car door during your fill-up, your vehicle’s interior may soak up a splash and leave you with upholstery that reeks. Fortunately for automobile drivers everywhere, the pungent scent of petrol doesn’t stand a chance against the triple threat of baking soda, vinegar, and hot water. Mix a solution of equal parts baking soda, vinegar, and water. Dip an old rag in the solution and gently rub it over the source of the stench in the car, whether its the seat cushion or fabric floor mat. 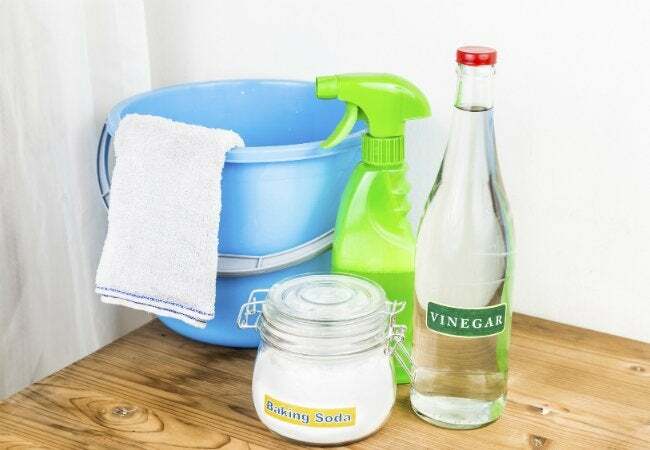 The friction created by the rag, combined with the stain-lifting and odor-fighting powers of baking soda and vinegar, eliminate gasoline stains and accompanying odor on contact. Due to being highly flammable, gas-sopped clothing or shoes are better left discarded. However, smaller gasoline stains from the accidental drip still stand a chance of being saved—but not from washing alone. The oily residue requires pre-treatment to be safely and effectively removed. Start by air-drying the stained items for a full day outdoors. 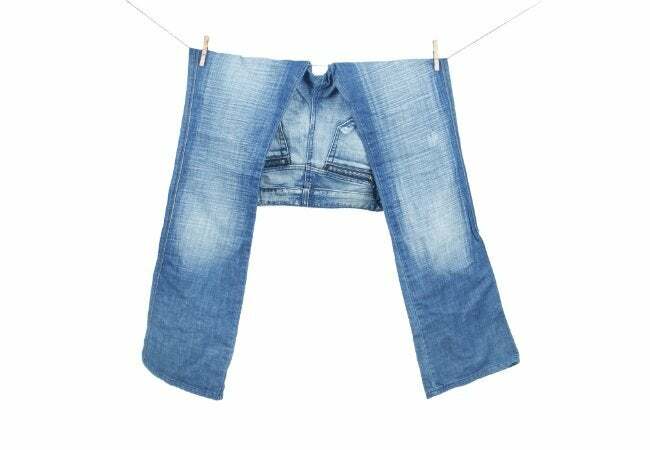 (If the scent is particularly strong, you might want to soak them in vinegar for at least one hour, then return to the clothesline to fully dry.) You do not want to toss garments or shoes into the washer before you’re certain that the smell (read: the fumes) has diminished because of the slight risk of combustion in your laundry appliances. When taking a whiff of the garment no longer fills your nose with the scent of fuel, vacuum and then rub a mild dish soap into the gasoline stain. Place the garments into your washer in a load by themselves—you won’t want any missed residue or odor transferring to any other clothing—and machine-wash normally on the hottest setting that’s safe for the type and/or color of fabric. When the cycle ends, hang it up to dry (or, in the case of sneakers, air outside). Now take a load off, knowing that your wardrobe is once again fresh, clean, and odor-free.